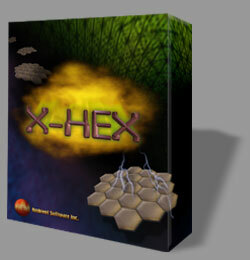 X-Hex is a game I programmed a long time ago. This game is still very exciting to play and I believe was ahead of its time when it was written. The idea stemmed from my brother who had described a game to me he had played on the Unisys computers from the 1980’s. E-games wanted to publish this title originally but that deal fell through in order to keep IP and publishing rights. I think in the near future I plan to resurrect this product in all of it’s glory. Today this game would be perfect for a tablet or mobile device which did not exist back when it was created. The best part of programming this game was the artificial intelligence. I designed the multiplayer aspect to be editable, and it worked great. You were able to choose to play against multiple personalities, all of whom had there very distinct game play. This entry was posted in Old Projects, Projects. Bookmark the permalink. Removed the other article? Well alright. I left a comment on your Youtube channel. I used to play this as a kid and would love to play it again. Is there some way this could happen?